New historical evidence is shedding light on the internment of Japanese people in Alaska during World War Two. A small ceremony held last Friday at Joint-Base Elmendorf Richardson was one of the first of its kind, according to officials present. The ceremony fell on the official Day of Remembrance held nation-wide, and is part of an expanding effort to recognize the experiences of Southeast Alaska’s Japanese community during the war years. Alice Tanaka Hikido was nine years old on the night in 1941 when FBI agents took her father from their home in Juneau. Her father was one of 17 men brought to the Army’s Fort Richardson in Anchorage for several months before they were sent to an internment camp in New Mexico. Hikido and the rest of her family stayed in Juneau until April of 1942. Then they were deported to a camp in Idaho. The family was part of the 110,000-120,000 people of Japanese ancestry on the West Coast detained for years during World War Two. “And about 200 came from Alaska,” said Hikido. She spoke to a room of a few dozen people as part of the Day of Remembrance held every year on February 19th, the anniversary of Executive Order 9066, which was the basis for forcibly removing Japanese-Americans from their communities to government camps. Colonel Timothy Wulff is the deputy installation commander for Joint-Base Elmendorf-Richardson. He says this is the first such event of its kind held at the base. “Something like this should never happen again,” Wulff told the audience during opening remarks. The event’s uniqueness comes from the fact that it took place inside a building sitting on the site of the little-known internment camp that was only recently evidenced. Doctor Morgan Blanchard is an archeologist, and uncovered a rare map showing where the camp was built. He pointed out the window of the Army Reserve Building, looking south towards a parking lot. Blanchard had made a point of noting that design multiple times during his presentation and in a brief interview. Blanchard authored a report after an archeological investigation into the site. They found a lot of material, but none of it conclusively tied to the camp. While there is plenty of evidence corroborating the designs laid out in the 1943 map he discovered, none of the hastily constructed buildings or structures remained. 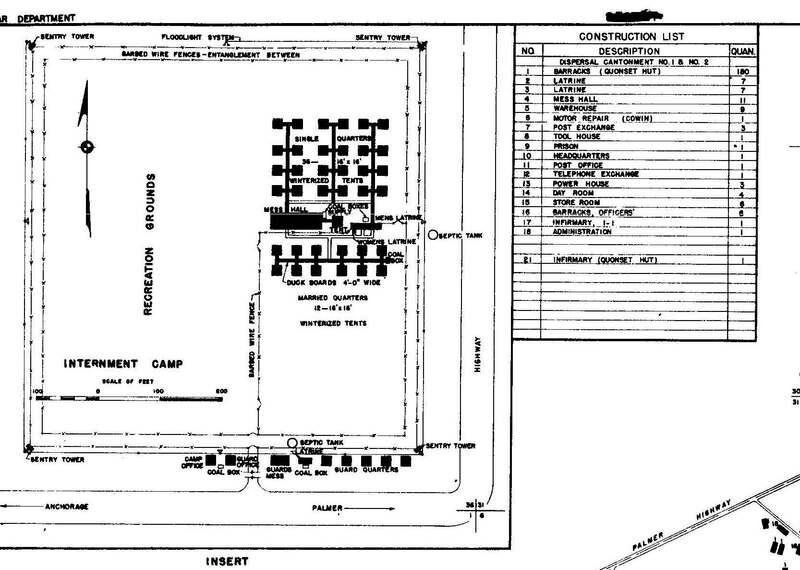 While Japanese men were brought to Fort Richardson in December of 1941, it wasn’t until February of 1942 that construction of the camp started. 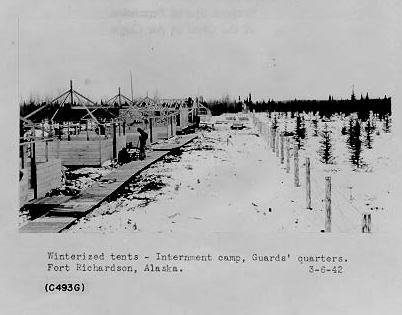 And even then, it wasn’t much: 16-by-16 arctic tents on top of wooden platforms with latrines and walk-ways. By the time it was done on June of 1942, the 17 men had been moved. The camp has long been known about, but physical evidence substantiating its story have been sparse. The ceremony was held the same day as a screening of the documentary ‘The Empty Chair,’ which tells the story of this captivity from perspective of the Japanese community in Southeast Alaska. Before Hikido and her family were deported from Juneau, the high school arranged an early graduation for her brother John. “Later the next month, in May, when the actual graduation took place, an empty chair was placed with the rest of the graduating students to honor John, and to acknowledge his absence, and the absence of the total Japanese community from Juneau,” Hikido said, emotion creeping into her voice. In the last 20 years more people have begun sharing their experiences in the internment camps, according to Hikido. And she sees those stories as deeply relevant to the present. “When people get fearful we tend to lose our sense of what’s right and wrong,” Hikido said during an interview after the even. The ceremony was organized by the Alaska Chapter of the Japanese American Citizens League, which is asking the Army to let them use the area as an “interpretive site,” permanently commemorating all that took place.